[Jonas] sent in a surprisingly retro concept given the number of small cheap funky video recorders on the market. He built his own. At the heart is a sony Digital8 recorder, combined with a security camera and a SLR lens. It’s finished out with an LCD viewfinder and a handful of AA batteries to power the security camera. wow.. that’s awesome. anyone have an idea how to record from the thing if you’re using a camera with an analogue output and don’t have the digital8 recorder? i love modular design concepts like this, but for me it falls down at the requirement for a specific recorder, which if it was cheap on ebay before, probably won’t be now. I’m curently about to make a 2. version camera, smaller, better, etc. Pretty good. As a pro camera op, I’d be a little afraid of what my clients would think if I showed up on a shoot with one, but I do actually use a quite similar system for shots where I can’t put a big ol’ broadcast camera. I use a very small security camera, just with its built in optics, and a wide angle converter, and then a $200 MiniDV camera with analog inputs. Makes a perfect rig for doing things like taping to body panels of cars or flying down a road inches above the ground. (Obviously with the MiniDV recorder/camera in the car, but the security camera outside). And as to the Super8 camera, are you going to add a CCD where the film plane was? That’d be a pretty cool idea. EBay always has a ton of really cheap Super8 cameras. HMM why not use a Hard drive instead of a Super8? I’d be interested in something like this if I could tak on my own 400GB IDE drive… at very least it’d be cutting edge as the HDD camcorder seem to be the latest trend these days. It is going to be with a harddrive… but i still need the super8 camera to make it. I built something similar about 6-8 months ago for infrared night videos. I use my COWON A2 as a DVR. Camera powered by three 2400mah LiIon batteries built in the frame. 5 watt Infrared LED illuminator… Which is TOO powerful for anything closer than 10 ft. Removed the camera’s infrared filter, so on daylight videos the color is a little off, but I didn’t intend to use it as a regular camcorder anyway. Still needs some finishing touches, but works fine. Totally is a DIY camcorder! 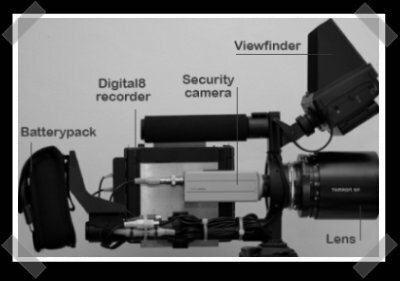 It doesn’t use a camcorder… It uses a CAMERA and a RECORDER. Put the two together, and ya get a CAMCORDER. Get it? some alternatives to the digital8 recorder are the samsung sports camera, or, if you want to use your own security camera, the aiptek personal media recorder/camcorder, which is $150 and records your video to an SD card.